One of my favorite comfort foods is Shepherd’s pie. Sometimes I make it with tofu but the other day I thought about trying a roasted veggie version. Best thing about this is it’s the ideal way to use up leftover vegetables and other items that might be sitting in the fridge and pantry. You don’t have to roast the vegetables for this but I think it makes the flavor more intense and worth it. Place the vegetables in a roasting pan and coat them with oil and some salt and pepper and roast them in a 375 degree oven for about 30 minutes or until they carmelized. Stir them in the pan a couple of times during cooking. While the vegetables are roasting make the mashed potatoes for the topping. About one pound of potatoes should be enough, although I didn’t have quite enough to cover all the vegetables. 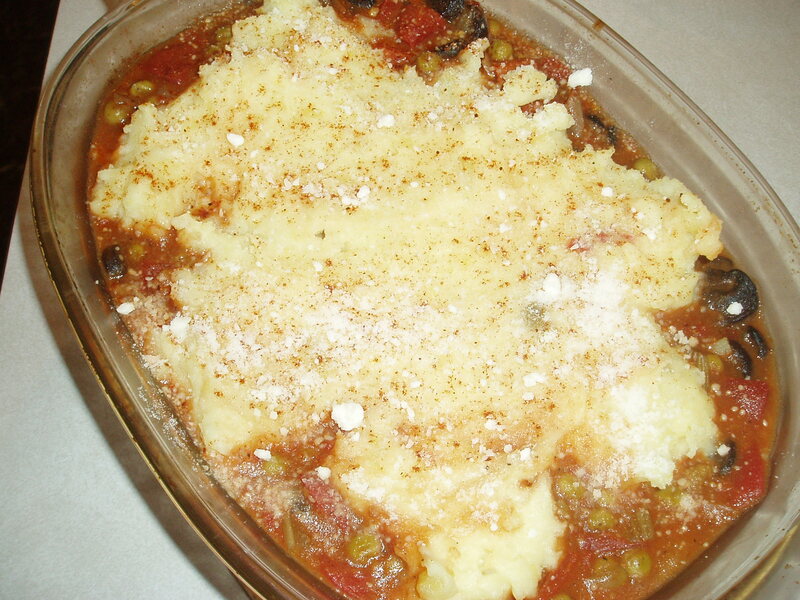 I added about a 1/4 cup of Parmesan cheese when I mashed them because I think it compliments the vegetables. Set aside when ready. 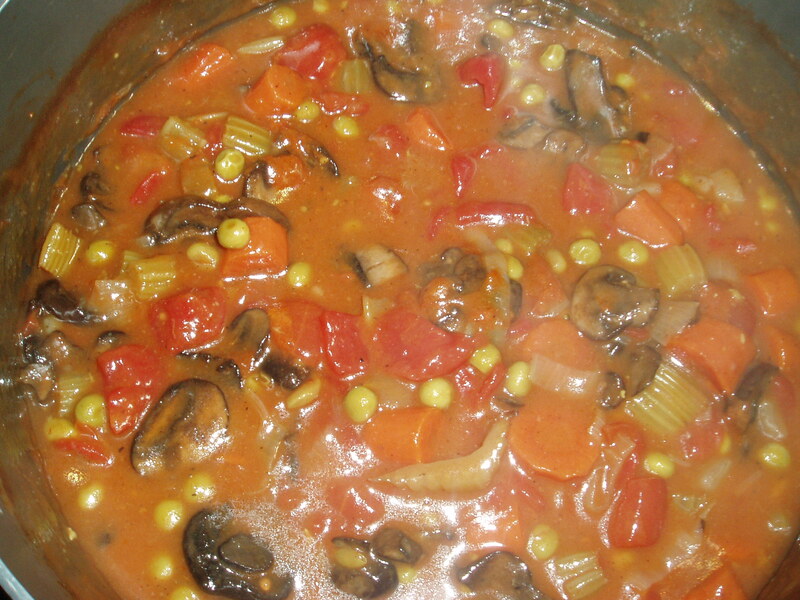 Heat together in a saucepan, 1 14 ounce can of diced tomatoes and about 2 cups of stock. Bring to a simmer and add the roasted vegetables and also about 2 tablespoons of tomato paste, salt, pepper and some onion powder. Bring this to a boil then turn it down to a simmer. I added some seasoned flour mixed with water to thicken it and then let it reduce down for about five minutes. I also had some leftover peas that I added. Pour this into a baking dish you’ve sprayed with cooking spray and then top with the mashed potatoes and sprinkle with more Parmesan cheese and I also like a sprinkling of smoked paprika too. Heat this in the oven for about 15 minutes or until the vegetable mixture is bubbling and the potatoes are slightly browned. You can get about eight servings out of this recipe. WordPress whose site this blog appears on tells me this will be my 575th post! Thank you to everyone who’s been reading this since post number one. Here’s to the next 575. One thing I love about the holidays is the chance to make some appetizers or finger foods that can be made ahead of time and pulled out of the fridge or freezer when company stops by or you’re in need of a snack. Two things I always rely on are filo pastry and cream cheese. First up is a cream cheese spread that I use on crackers or cucumber slices. Leftovers, if there are any, make the perfect spread for sandwiches…great with leftover turkey. I’ve even spread it on toast for breakfast. Remove the cream cheese from the refrigerator about 15 minutes before you plan to make this spread. Place the cream cheese in a bowl and stir in sun-dried tomatoes, then mix in the oregano and thyme. You can also add some of the oil from the sun-dried tomatoes to thin it out and boost the flavor. Put the spread back into the refrigerator, but take it out again about 5-10 minutes before you eat it so it spreads more easily. Preheat oven to 350 degrees. Place one sheet of the filo dough on the countertop or cutting board and brush with some of the melted spread/butter. Top with another sheet, brush with spread/butter and continue with the other two sheets, making sure you brush the top sheet with the butter/spread. Cut the sheets into 12 squares. Take a muffin pan and mold each stack into each of the cups…you’ll get some overlap at the top, but don’t worry because it makes them look more decorative. Bake for about five minutes or until lightly golden brown. Let them cool on a wire rack before you fill them. They can be made a couple of days in advance too. One of the fillings that always seem to get people coming back for more is curried chicken salad. (This is also a good filling for sandwiches and stuffed tomatoes too). ½ cup chopped seedless red grapes. Simply mix everything together and let it sit in the fridge for about an hour, more if you have time. The combination also works well with tuna too, just leave out the grapes. I’ve also had success with using the filo cups for mini quiches. And another quick idea is to take a flavored cream cheese, like onion or salmon, whip it until it’s light and airy and put the mixture into a pastry bag and pipe the mixture into the cups. Maybe top with a pitted olive or a toasted nut like a pecan. 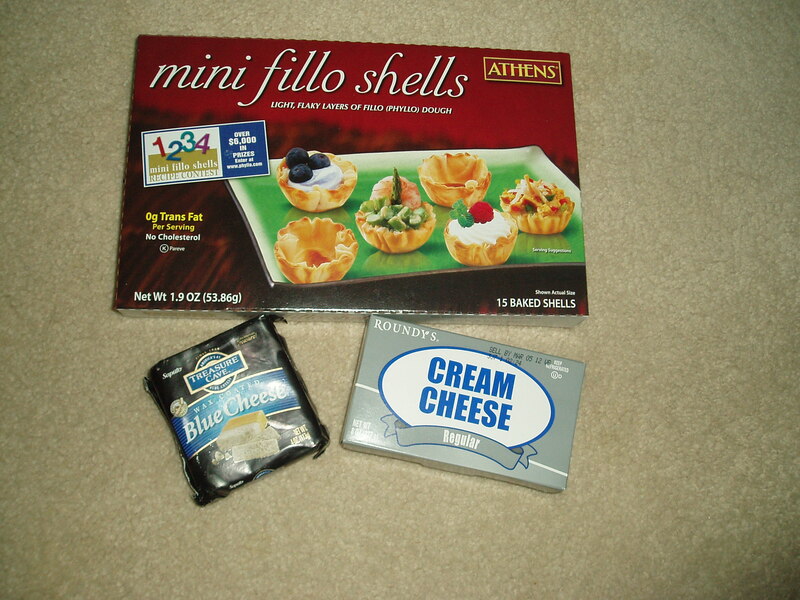 This year I thought I’d try to come up with some more good holiday combination using cream cheese which is on sale just about everywhere right now. One idea is to combine it with chopped dried cranberries and some candied orange peel. If you want it sweet, try adding honey or confectioner’s sugar. I thought these would be good rolled into balls and then rolled in chopped pecans and served on cocktail sticks. One other sweet combination I’m going to try is adding honey or confectioner’s sugar, cocoa powder (or even melted chocolate) and chopped crystalized ginger. And a savory treat. Blue cheese always seems to add some pizzazz to just about everything so combining it with cream cheese sounds like a winner. I’m thinking this would even make a great topping for baked potatoes for a quick meal post holidays. And check out www.education.com. If you’re a parent you’ll find a ton of good stuff not only for the holidays with things like crafts and printable cards, but a winter activities book you can download too.